The rumors that were gathering steam these last few weeks have now turned official. The Jam have reformed. Without Paul Weller. A year ago, founding Jam drummer Rick Buckler formed The Gift, his own Jam “tribute” band, with Russell Hastings and David Moore. A few months ago, founding Jam bassist Bruce Foxton began showing up on stage for cameo appearances. Friendships firmed, credibility apparently secured, it seemed like it would only be time before they made their old/new musical partnership permanent and laid claim to the Jam’s fame and fan base. The Jam as shown on the press release for a new Tour in a classic Pennie Smith photo from what I believe would be 1977. Wording in the press release is purposefully more vague about the Jam’s name. Laying claim to the name is a little more dubious, and the duo appear to have covered themselves in advance by billing their act as ‘Bruce Foxton and Rick Buckler from The Jam.’ You can’t quibble with the accuracy of that statement and it seems no less a breach of the trades description act than tribute groups like The Jamm, who go so far as to borrow the group’s old logo. 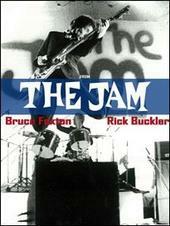 Full details of the ‘From The Jam’ tour can be found here. A thread on the Reunion is running over at the iJamming! Pub. Paul Weller has yet to pass comment.